Our oceans are suffering, help! Our oceans are our rubbish bins for all the plastics we throw away which does not end up in a landfill or an incinirator. Most people are not aware that everytime we use a plastic wrapper or bag and we throw it away, the winds carry it, the rains and rivers wash it away and the majority ends up in our oceans. Here is an animation movie that illustrates this problem. We all need to make a conscious effort to reduce, reuse and recycle our plastic ways! You can make a simple step, become a volunteer with our SmallSteps ambassador program and encourage your friend, neighbours, school mates, family to say not to plastic bags. Here is Mockumentary film that beautifully illustrates the urgency of our battle with the menace of plastic bags. Please share this movie with your friends and contacts, your local school, your college friends and family members. It is important to build an awareness so as to unite in fighting this danger to our environment. 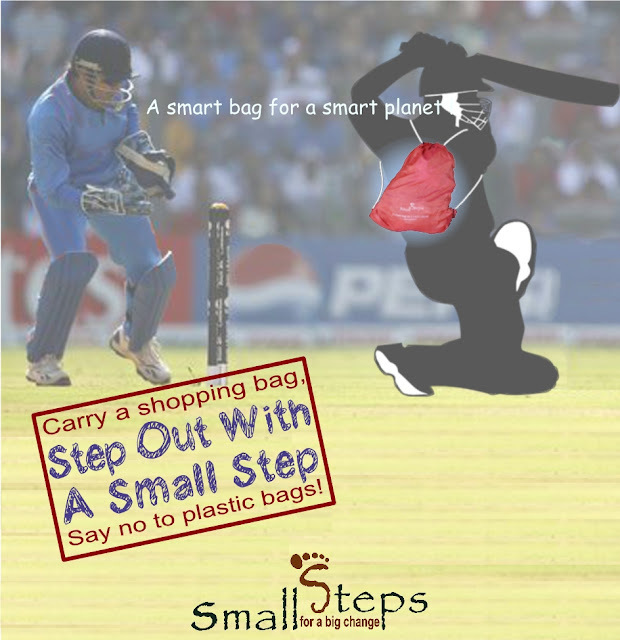 We recently launched SmallSteps bags in a big way with Landmark stores. The bags are available at the Point of Sale in each store. We launched under a new campaign called Step Out with a Small Steps, and each box of small step bags reflect a different graphic illustrating this campaign. The concept of the campaign is to inculcate the need to carry a Small Steps bags with us at all times so as to be able to say no to plastic bags. Hence, which ever your profession, what ever your activity, always have a smallsteps bags handy to carry your things. Do join us by grabbing your smallsteps bag today at anyone of the Landmark stores.